Posh chairman Darragh MacAnthony is loving life at the ABAX Stadium. Peterborough United owner Darragh MacAnthony has fallen back in love with football thanks to the recent exploits of his free-scoring team. 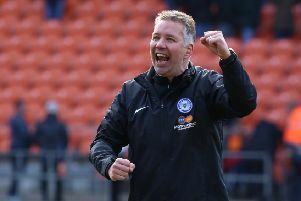 The charismatic chairman admits in an interview with BBC Radio Cambridgeshire that the sport had become a strain as Posh strived unsuccessfully to regain their Championship place in the last two seasons. Dwindling income had also increased MacAnthony’s concerns as he started to second-guess his policy of recruiting young and hungry players before moulding them into attack-minded entertainers. Chris Forrester was a bargain buy according to Posh chairman Darragh MacAnthony. Happily the Posh form under the new management team of Graham Westley and Grant McCann has restored MacAnthony’s self-belief. He also revealed that he missed the opportunity to appoint Westley in the summer, preferring instead to keep faith with Dave Robertson after a moderately successful spell as caretaker-manager. “Graham wanted to see me in May, but I didn’t give him the time of day,” MacAnthony admitted. That was a mistake on my part. He did everything he could to attract my attention. He spoke to Barry Fry, he sent me texts and he e-mailed me, but I was too lazy to see him. “Luckily when my manager’s job became available again he paid for his own ticket to see me in the United States and we hit it off straight away. We work very well together and there isn’t a person at the club who doesn’t get on with him. He’s very special. “And his team are a joy to watch. The enthusiam of the players and the fans, plus the goals, the attacking football and the quality on show has been wonderful. “I guess all clubs, even successful ones, go through periods when nothing seems to go right. Everything we had become famous for stopped happening and I did start questioning myself. Had my recruitment policy stopped working? “It all became a serious strain on me which a dip in income didn’t help as gates dropped. I bought a football club to enjoy it and for a while it wasn’t fun. “But I’m in love with the game again now. It’s been beautiful to hear us being called ‘the entertainers’ again. We are on the up and getting lots of positive headlines which we deserve for the excitement we have been delivering. “It’s been great to see that players written off by previous members of staff are actually as good as we thought they were when we brought them to the club. Our policy does still work and a very young team has been showing its undoubted potential. “There was interest in the summer from people wanting to buy the club, but I’m not interested in selling as I’m too busy re-visiting my dreams. “I’m not even too concerned about the league table. That will take care of itself. We are enjoying the football and the evolution of a special set of players. We’re building something that’s worth watching and it’s worth paying for! MacAnthony also mentioned that he thought buying Irish midfielder Chris Forrester could be ‘the best 40-5ok we’ve ever spent’ and that they won’t be taking their interest in recent Derry City trialist Patrick McElerney any further after a brief trial. MacAnthony stated that that there could be some transfer business before the loan window closes on Thursday (November 26). Posh are short of available central defenders. He also said that there could be recruitment when the January transfer window opens, but that Westley is keen not to disrupt the excellent spirit in the dressing room. Posh host Barnsley in a League One match tomorrow (November 24) seeking their fourth win on the bounce. Westley’s side are the top scores in the top four divisions of the Football League with 39 goals in 18 League One matches.